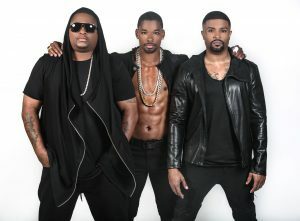 The multi-platinum R&B group NEXT has been entertaining music fans with their soulful voices and energetic live performances for almost 20 years. Originally from Minnesota, NEXT’s members T-Low, Tweet and RL were first discovered by KayGee of Naughty By Nature and signed to Arista Records in 1997 by the legendary Clive Davis. NEXT’s debut album “Rated NEXT” produced the hit singles “Butta Love”, “I Still Love You”, and “Too Close” which ultimately became Billboard’s #1 single of that year and made NEXT a household name. In fact, “Too Close” remains #24 on Billboard’s “Hot 100 All Time Top Songs” and #4 on the magazine’s “Sexiest Songs of All Time.” The group’s sophomore album “Welcome II NEXTasy” was equally successful with its first single “Wifey” topping the R&B singles charts. After the run of their second album, NEXT joined Clive Davis at his newly launched J Records label releasing their third album “The NEXT Episode” and producing songs for multiple movie soundtracks. After spending time apart to focus on individual projects, the three members of NEXT reunited in 2016 to begin recording music for a highly-anticipated new album set to be released in early-2017. Their latest project will feature the same melodic and smooth R&B vocals that their dedicated fans have come to expect, while incorporating the dance, dub step, and retrotech beats that today’s new music lovers crave. With over 18 million records sold, eight Billboard Music Awards, four ASCAP Awards, and multiple nominations for American Music Awards and Soul Train Awards to their credit, the group has proven that they have mastered the formula for success.